Sandy your cards are lovely. The design is just right. Thank you for being a part of this great cause. Beautiful card. Thanks for sharing your process. What a beautiful concept, to have the baby, mom and dad represented by hearts! Great card, wonderful concept. Thanks so much for sharing your talent. Awesome technique on your beautiful card! Thanks for the technique info. Love it! Your card is lovely and for a wonderful cause. You are a master at watercolor. Thanks for always sharing great tips with those of us not so skilled at watercolor. Absolutely gorgeous! I would never be able to keep my red and blue paints from bleeding into the yellow heart. Could masking have been used here by someone like me? Love your hearts on your card. BEAUTIFUL SANDY! AND I also enjoyed watching you work with these powders! THANK YOU!!! Such a good cause too. 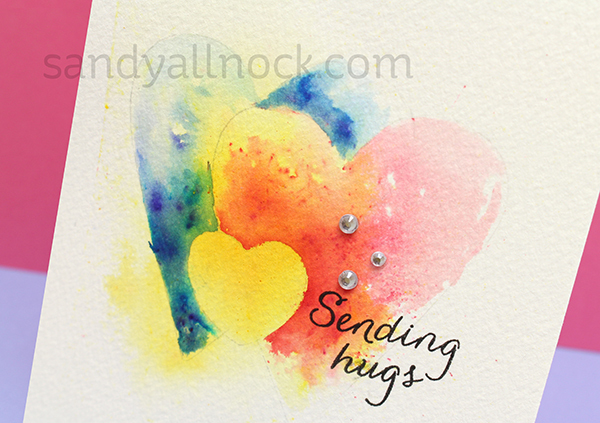 Pretty card–love the color hearts. Thanks for sharing. Such a pretty card. Love your technique. A great and artsy technique … for a lovely, kind, supportive endeavour. Such a beautiful and thoughtful card Sandy! Thanks for sharing this beautiful card and wonderful cause. Great technique. These stamps are a must. Sandy very interesting card and technique. Love watching your videos. Beautiful card. Love the colors and the concept. Beautiful card and a great technique. Thanks for sharing. Such a stunning and heartfelt card!!! I have a secret Sister that wants something to remind her of the 5 babies that she has lost. I thought maybe a canvas with mixed media but I wasn’t sure what else to do. Now I do! Thank you so much Sandy for all of your wonderful inspirational videos!!! I absolutely love this card and it’s meaning. I will definitely make a batch of these for the drive. Beautiful and inspiring. Thanks for sharing. You never fail to amaze me, with your skill as well as your heart. You inspire me to better things! Thank you. You certainly live your words to us. Thank you for all you do and for this tender sweet card. Beautiful card, with such clear meaning. I am inspired to make another batch for the drive. You are amazingly talented and sweet! So glad you honor Him in what you do. Simply gorgeous (I never come here expecting less!)! Awesome card, great cause thanks for the video! Sandy, your cards are always so beautiful! Thanks for sharing this technique. So pretty. The hearts are fantastic! Thanks for sharing your talent! Very lovely, and it really conveys the heartfelt message!! This is a beautiful card. 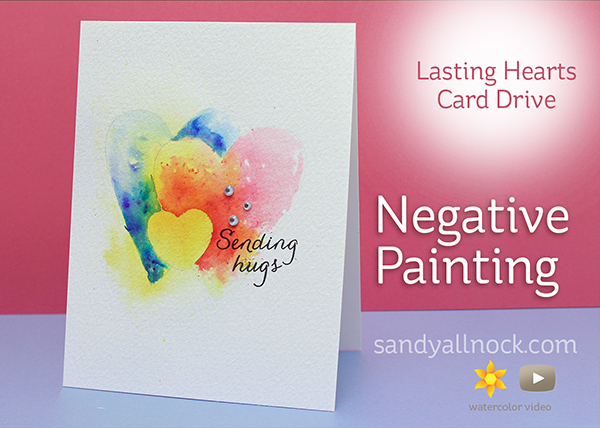 Having gone through this myself, having a heartfelt card really is meaningful. Amazing card. Amazing video with awesome tips. Amazing organization. Such a beautiful and meaningful design, Sandy! Thanks for sharing your technique! Lovely card and awesome technique! Thanks for sharing! Hi Sandy, This is such a wonderful cause for these mothers and fathers that lose their babies to miscarriage. I just have a couple of questions. Is this only for area? Also how do they know who to send the cards to? Are people able to submit a couple’s name to receive a book? Thanks for all your hard work and keeping us aware of these wonderful opportunities to help others! The books are given by the doctors so they know the women. I’m not sure what locations they are in—I’m sure you could ask on their Fb page. great card and great technique. Thanks Sandy! Beautiful card and wonderful technique, thanks for sharing!